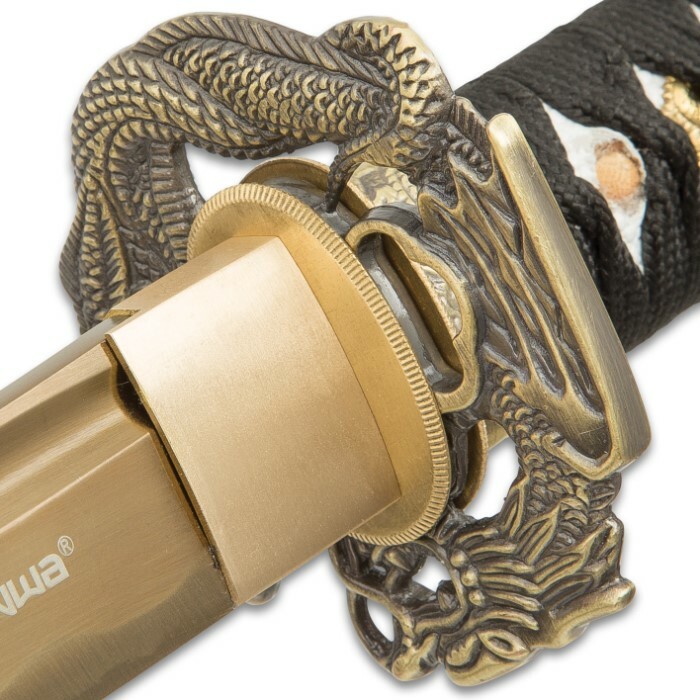 Combining the elegant luster of gold with the resilience and potency of high carbon steel, Shinwa's "Firefly" Katana represents a sublime fusion of radiant beauty and raw, unbridled power. 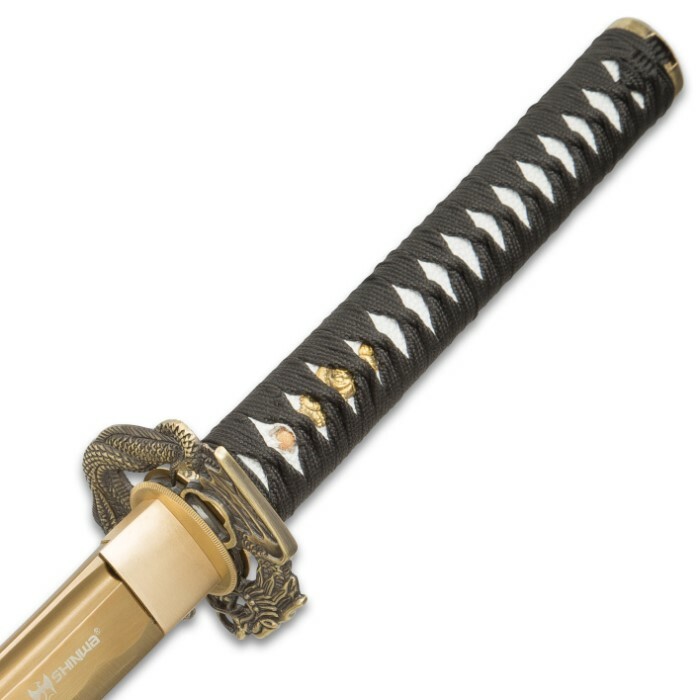 The painstakingly handcrafted samurai sword is no doubt stunning, with its sleek, fluid form and gleaming golden blade and saya accents. On display, it demands attention - a gilded, eye-catching example of Japan's legendary ancient swordcraft tradition. But make no mistake - the Firefly is as much a force to be reckoned with as it is a sight to behold. True to the katana's enduring, centuries-old reputation, the Firefly packs serious, downright unrivaled cutting power. Shinwa's master swordsmiths expertly hand forge every Firefly blade from 1045 high carbon steel blade, meticulously firing, hammering and shaping raw, molten metal into a sleek tanto profile. 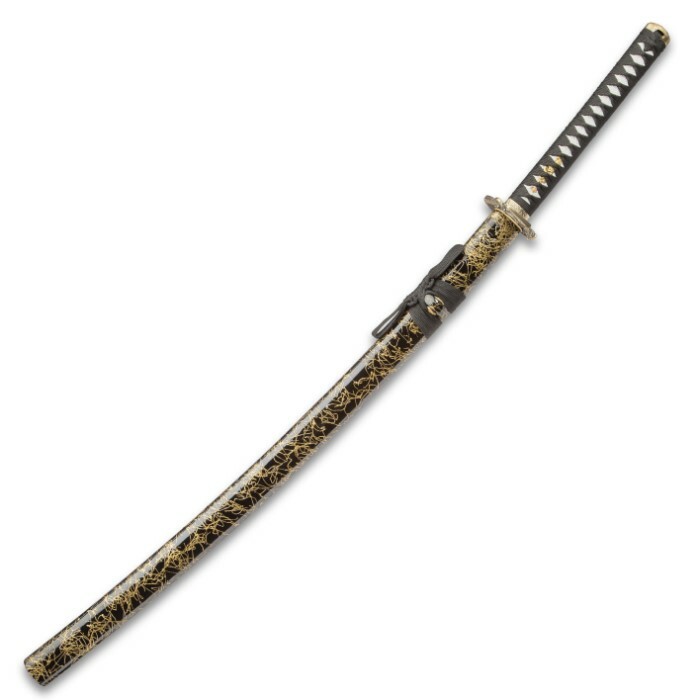 Weaponry scholars have long deemed the storied katana the sharpest sword in history, and the Firefly is no exception. It slices cleanly and effortlessly through traditional rolled tatami mats, thick bamboo and other challenging materials - all without sacrificing its carefully honed edge. Both "beast" and "beauty," the blade is bathed in a warm golden glow - a subtle point of contrast to the brilliant white faux ray skin same and traditional black ito. 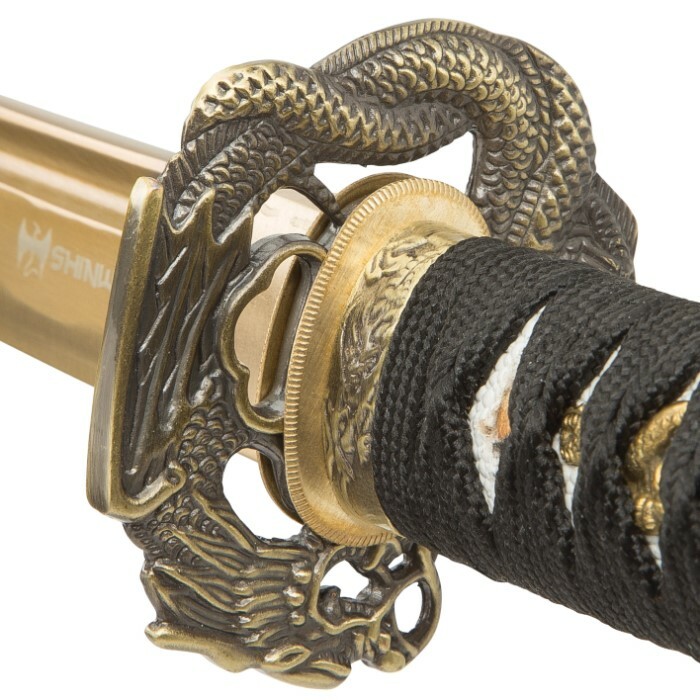 The antiqued metal tsuba depicts an iconic Asian-style dragon, facing off with a mythical viper in flawlessly cast relief. Both creatures are intertwined, enveloped in an intricate array of cresting waves. 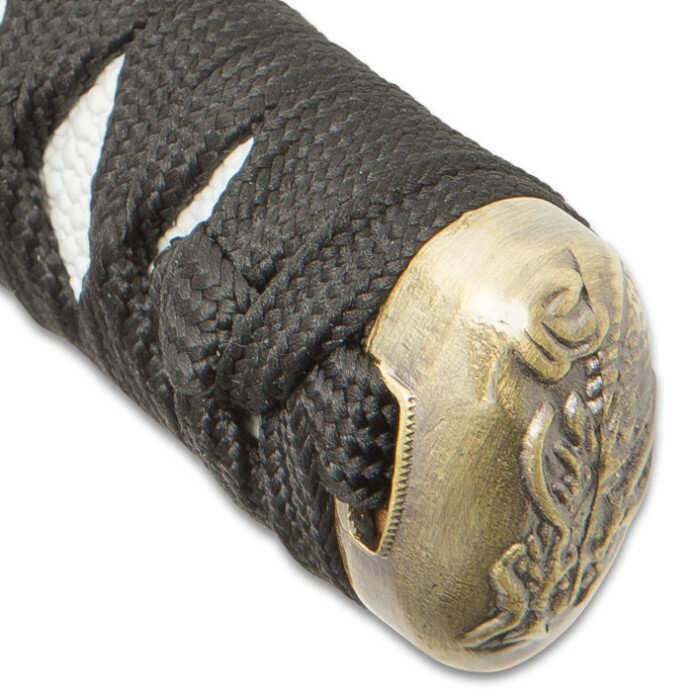 The scene is echoed in both the fuchi and kashira. 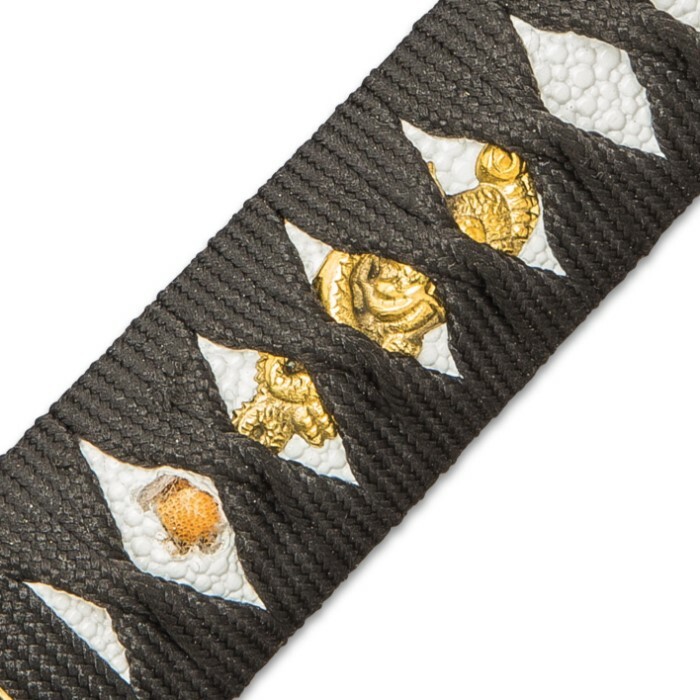 Traditional bamboo menuki secure the tsuka components, as in the katana of centuries past. Even the hardwood saya is uniquely impressive. The black hand-lacquered finish is offset exquisitely with a gold spatter pattern - evoking streaks of light radiated by fireflies on a dark, moonless night. Indeed, Shinwa's Firefly Katana shines boldly amongst a void of ordinary swords, both in the display stand and on the battlefield. "Catch" your "Firefly" today, and illuminate your sword or cutlery collection with a genuine handmade work of bladed art. This is a beautiful hand-made sword. I did some research and found that it is made in Longquan China, in a village where there are only expert sword makers and pottery makers. 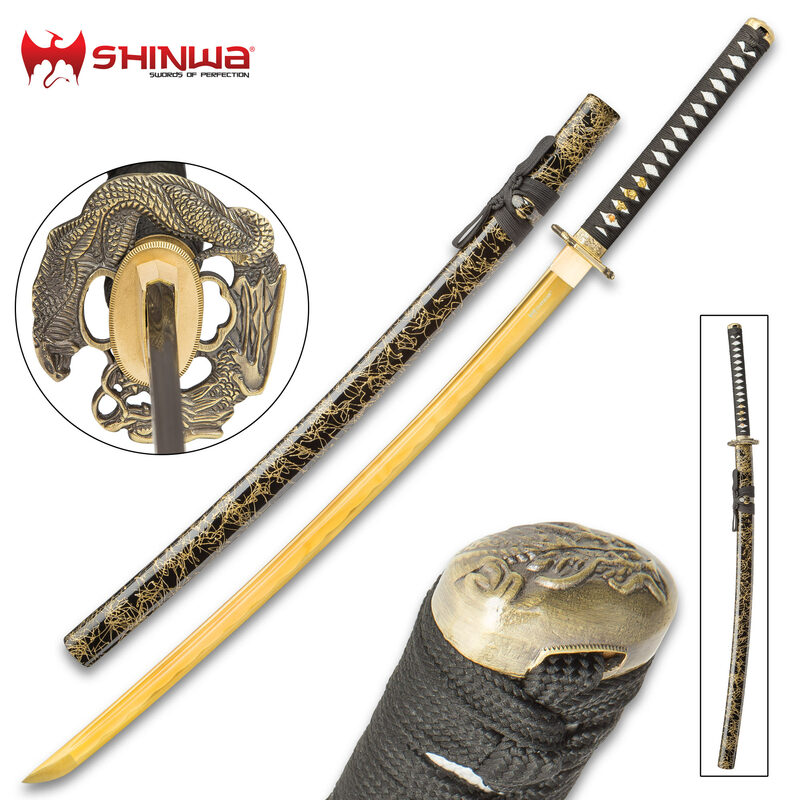 It is a great sword at a really good value and it was delivered as promised.., Def recommend. Thank you Budk for the beautuful Shinwa firefly that came in the post today! Always proud to add another Shinwa to the family! Just getting this out there that Budk has the best return policies that i have seen. If for some reason you are not satisfied with the quality of a product, you are welcome to return said item! It does happen that products sometimes are not the best of quality. Nobody's perfect, thats why Budk offers you a satisfaction guarantee. Mr Kadel in my opinion seems like a stand up guy that still has those old fashioned values that most businesses lack in this modern era. The firefly btw is awesome, now i need to stop writing this and look for the next addition to the family lol. Stunning sword, not Damascus but still, just beautiful. I lucked out and got 2 on the BOGO deal they just had. Got to me very fast (2 days) love the paint splattered scabbard as well, it has a great texture and looks really nice and compliments all the other hardware. This one was not as sharp as my other Shinwa katanas but is still very sharp. A few passes on the stone and then it will be ready to shave with. Would recommend this sword. All fittings are tight..Just good looking swords I will be proud to sisplay. I have yet to buy a Shinwa that I was not pleased with. I plan to buy others as I get the $ and proper deal to do so. Thanks Bud keep the deals coming!